Blyth High Street beat AE Phoenix Central to win the Standard Security Blyth and Wansbeck Sunday League JD Marnock Cup final. High Street took the lead when Adam Emmerson scored in off the post. Phoenix came more into the game only to see High Street double their advantage. Michael Johnson controlled the ball on the edge of the area and coolly lifted it over the stranded keeper. Second half saw the Phoenix start the much stronger try to find a way back into the game and they had several chances but were unable to take one. As it was, Street went on to seal the win when a long clearance found Anthony Goldie and he controlled the ball and beat a defender before finding the target. With time running out Chris Laidlaw scored Street’s fourth. NFA councillor Frank Scantlebury presented the trophy on behalf of sponsor Reay Security, with Laidlaw receiving the man of the match award. In the George Davison Cup final, sponsored By Port Training Services, Burradon and New Fordley retained the trophy when they beat Forest Hall CC in the final at Bedlington. Forest Hall put up a good fight against their illustrious opponents but were outdone. Goals from Scott Pocklington (2), Pyle and Dale Pearson. The trophies were presented by Colin Bassam from Port Training Services, with man of the match award going to Pockington. In the premier division, Ashington Bubbles went down 7-3 at home against Blyth South Beach CC. Bubbles played with nine players and scored through Che Aisbitt, Chris Hogg and Thomas Kendall. On target for Beach were Liam McKee (2), Lee Seller (2), Ray Armstrong, James Southern and Stuart Dickinson. 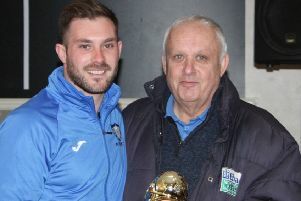 Blyth Comrades and Blyth and Tyne shared the points in an eight-goal thriller. Curtis Miller (2), James Woodhouse and Daniel Carr scored for Comrades with Martin Robinson, James Bell, Darren Walker and Andrew Stephenson replying. Blyth Last Orders secured the division one title with a 7-1 home win against Cramlington Green. Leading the scoring was Martyn Hepple with five. Andrew Farrier and Mathew Crook completed the scoring. Wes Mclean was on target for Green. Red Lion Bedlington and FC Beacon produced 15 goals between them as Lion won 10-5. Reece Farrell (5), Craig Webb, Callum Hermiston, Chris Smiles, Callum Donohue and Liam Gibson were on target for the inners while Nigel Morris (4) and Dan Atherton scored for Beacon. The Ashington derby between the Northern and Conchie ended 3-3. Daniel Costello (2) and Jason Riches scored for Northern while Jordan Hancock (2) and Michael Freathy were on target for Conchie.